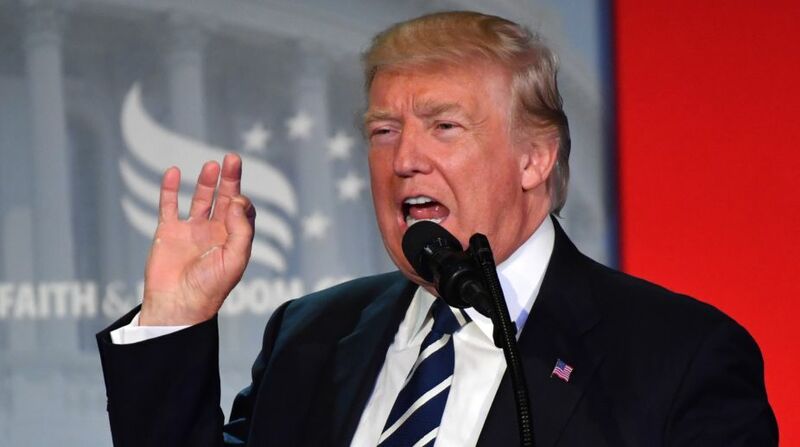 US President Donald Trump has hailed the liberation of Mosul in Iraq from the Islamic State terror group and congratulated Prime Minister Haider al-Abadi for the victory. “Today, Iraqi security Forces, supported by the United States and the global coalition, liberated the city of Mosul from its long nightmare under the rule of ISIS. “We congratulate Prime Minister Haider al-Abadi, the Iraqi security forces, and all Iraqis for their victory over terrorists who are the enemies of all civilised people,” Trump said in a statement on Monday. He said the US and the global coalition are proud to stand with the Iraqi security forces and all those who made this moment of liberation possible. The US-led global coalition has made tremendous progress against ISIS, more in the past six months than in the years since ISIS became a major threat, Trump said. “The victory in Mosul, a city where ISIS once proclaimed its so-called caliphate signals that its days in Iraq and Syria are numbered. We will continue to seek the total destruction of ISIS,” he said. Later this week, the small group of the global coalition to defeat ISIS will meet to discuss priorities to build on the progress in Mosul and Raqqa to set ISIS on an irreversible and lasting path to defeat across the globe, the US State Department said. The coalition's small group consists of about 30 key coalition stakeholders who play a major role, either military or non-military, in the campaign to defeat ISIS. Congratulating the people of Iraq on the liberation of Mosul, Secretary of State Rex Tillerson said it is a “critical milestone” in the global fight against ISIS and underscores the success of the international effort led by the Iraqi security forces. “During ISIS' brutal occupation of Mosul, it terrorised and brutally murdered thousands of civilians, used mosques, schools and hospitals as bomb-building facilities and fighting positions and just recently, facing defeat, destroyed the historic al-Nuri mosque and al-Hadba minaret,” he said. “Under the Iraqi leadership, the United States and our coalition partners will continue to work closely with the UN to stabilise the liberated areas throughout Mosul, supporting the return of displaced civilians to their homes. “There is still much work to be done to defeat this enemy. The global coalition will continue to stand with our Iraqi partners to ensure that ISIS is defeated wherever it remains in Iraq,” he added. In a statement, the coalition welcomed Prime Minister al-Abadi's announcement of Iraq's victory in Mosul. “We congratulate the Iraqi security forces on their remarkable progress against ISIS while making extraordinary efforts to safeguard civilian lives,” it said. “Make no mistake, this victory alone does not eliminate ISIS and there is still a tough fight ahead. But the loss of one of its twin capitals and a jewel of their so-called caliphate is a decisive blow,” Lt. Gen. Stephen J Townsend, commanding general of Combined Joint Task Force – Operation Inherent Resolve, said. “However, this victory does not mark the end of this evil ideology and the global threat of ISIS. Now it is time for all Iraqis to unite to ensure ISIS is defeated across the rest of Iraq and that the conditions that led to the rise of ISIS in Iraq are not allowed to return again,” Townsend said. Senator Tim Kaine, a member of the Senate Armed Services and Foreign Relations Committees, said this is a significant victory for the Iraqi forces. “But the fight is far from over. As we consider next steps in the campaign against ISIS, including to prevent its resurgence in Mosul and other areas where we have had success, I remain concerned that Congress has been largely absent from the debate,” he said.